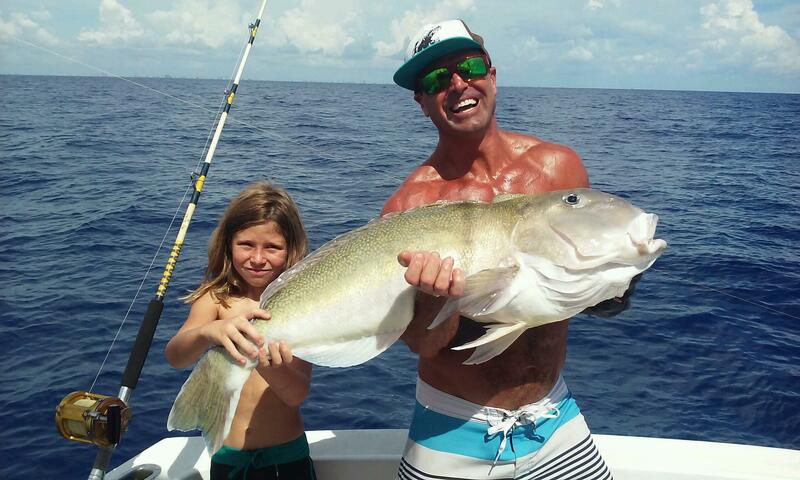 Huge golden tilefish caught deep dropping in over 600ft of water. We’re doing a lot of deep drop fishing off Ft Lauderdale this week and we’re catching some pretty cool stuff. With the surface water temperatures being so hot, it’s sometimes good to go deep this time of year. Snappers and groupers are the main bottom fish that everyone knows. They are biting good around the wrecks. Any wreck in 200+ feet of water should be holding some fish. Our main wrecks are all in the 200-400 ft of water range. Vermilion snapper are a deepwater snapper that we catch by dropping a chicken rig down to the bottom. A chicken rig is a rig with 4 or 5 hooks, each tied individually in a series and each baited with a chunk of squid. The point of the rig is to catch multiple fish on the same drop, or if the snappers are playing with and just picking at the bait, it gives you multiple chances to set the hook on the shy feeding fish. It’s a great rig for bottom fishing and sometimes yields big numbers of fish, very quickly. Vermilion snapper are great because they school up so if you find a spot where you catch 1 or 2, there’s probably a berry patch of them there and if you keep dropping in that area, you might catch a bunch. Groupers are also biting on the 200-400ft shipwrecks. 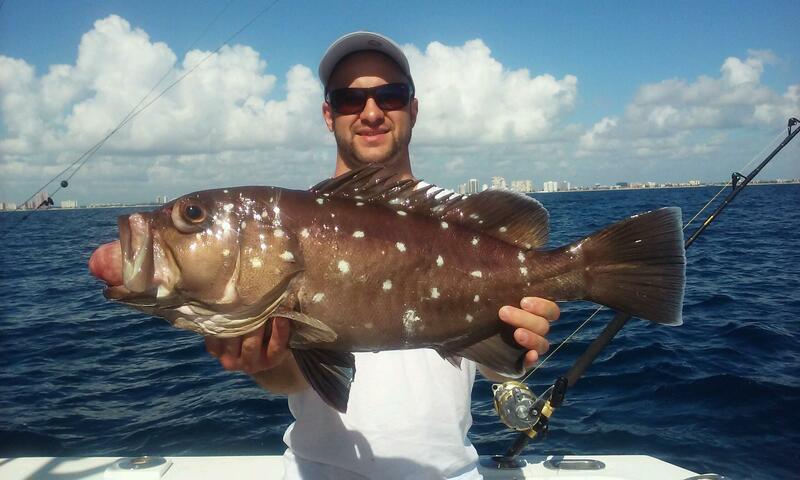 Black grouper, gag grouper and snowy groupers are our main deep water groupers. They eat squid, live baits, bonito chunks or just about anything you throw down there. They aren’t that picky of eaters, it’s just a matter of finding which spot they have congregated on. The summer and fall months, with their calm, tranquil seas, make for great conditions to go grouper fishing with the deep drop rigs. Warsaw grouper is another kind of grouper that sometimes bite when dropping over these same wrecks. Warsaws are one of the largest grouper species and some of these warsaws are behemoths. They have no predators, except perhaps for our crew, so they can grow to outrageous sizes. We do a lot of live baiting or chicken rig fishing over the wrecks on our deep sea fishing trips, but that’s only about 1% of the bottom off our coast. There’s a lot of other areas that fish congregate on too. If you go to the super deep stuff, you can catch some crazy fish. 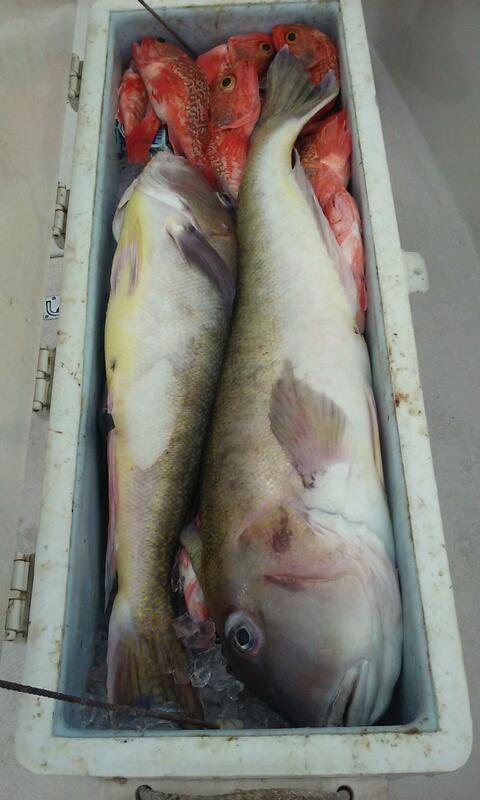 Golden tilefish are a great eating gamefish species that we catch deep dropping anywhere from 500-800 ft of water. That’s a bit too deep for hand cranking rods, so we usually use electric reels to catch them. It takes a 10 pound + sinker just to get your bait to the bottom. It takes a tremendous effort just to reel in the weight by hand, not to mention if you also have a fish on the other end of the line. Electric reels are the only feasible way to target these deep dwellers. Using the electric reels, it allows us to blanket a large area with multiple drops in a more reasonable amount of time to try to find where the fish are. Gigantic Wreckfish caught on the bottom in 800 ft of water on our sportfishing charter. Fishing depths of 500-800ft of water, we catch some pretty unusual stuff. 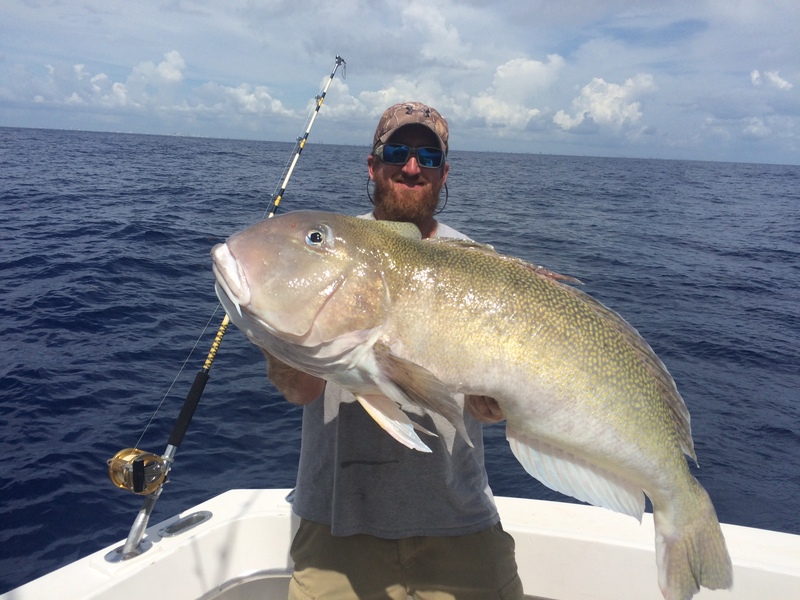 Golden tilefish are the main target, but we also catch rose perch, scorpion grouper, barrelfish, oilfish, lancetfish and sometimes fish that we can’t even identify. These fish live deeeeeep, so some of them have some strange adaptations to their anatomy, making them very different than the regular pelagic fish that we catch. Glow in the dark fins, strange scales, long streamers coming off their fins are a few of the strange adaptations. There is one fish species, a barrelfish, a super deep dweller that we caught a few of this week. They are extremely rare, I’ll be most Ft Lauderdale fishermen haven’t ever caught one. Barrelfish excrete an oil through their skin that flat out stinks. It smells like rotten fish. But when you filet the fish, barrelfish are one of the best eating fish you will ever try. Lancetfish is another odd one that look like a cross between a sailfish and a barracuda if you can imagine that. There are some crazy fish down there, so just when you think you’ve caught everything and there’s nothing new left to catch out there, think again. 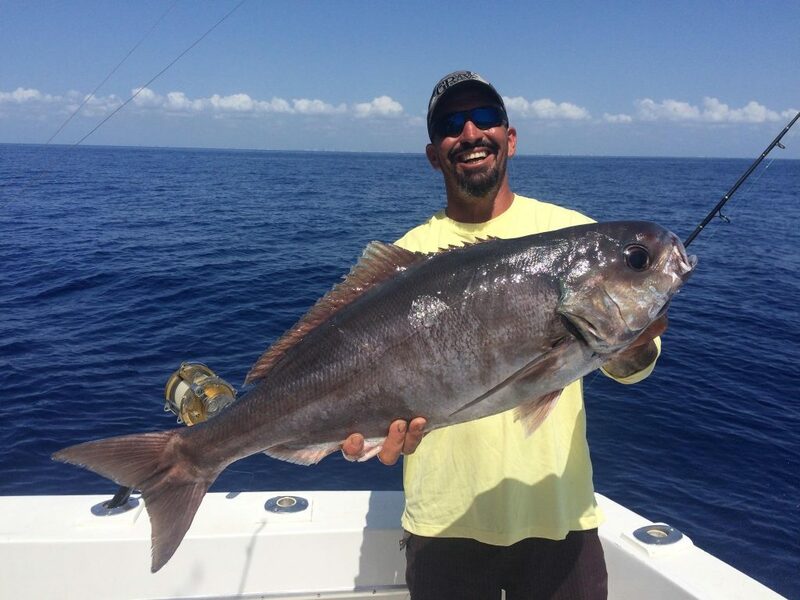 Big barrelfish caught deep sea fishing with electric reels. 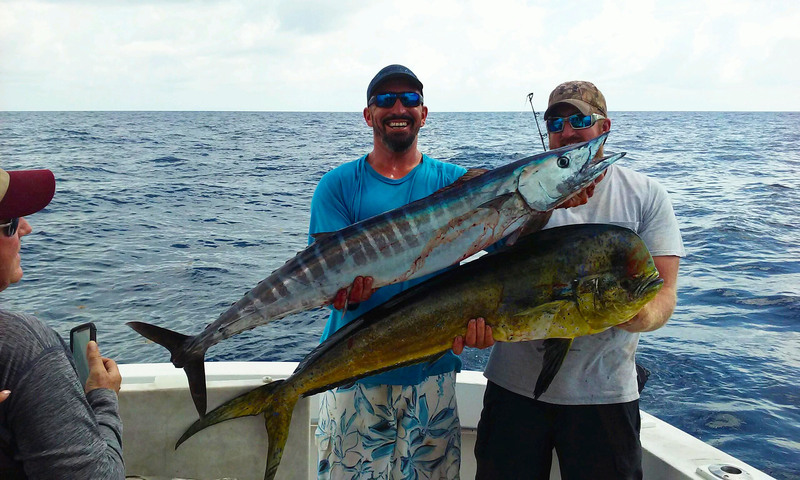 If you’re interested in a deep drop fishing trip, it’s one of our specialties. We prefer to use the electric reels, but we’re set up for hand crank also. Give us a call and we’ll set up a deep drop fishing charter for your group. Good luck to everyone fishing with us this week. The fish are out there. Let’s go fishing! Nice box full of tilefish and scorpion groupers. Nice catches this week on our drift and sport fishing charters. The action on the reef is red hot. 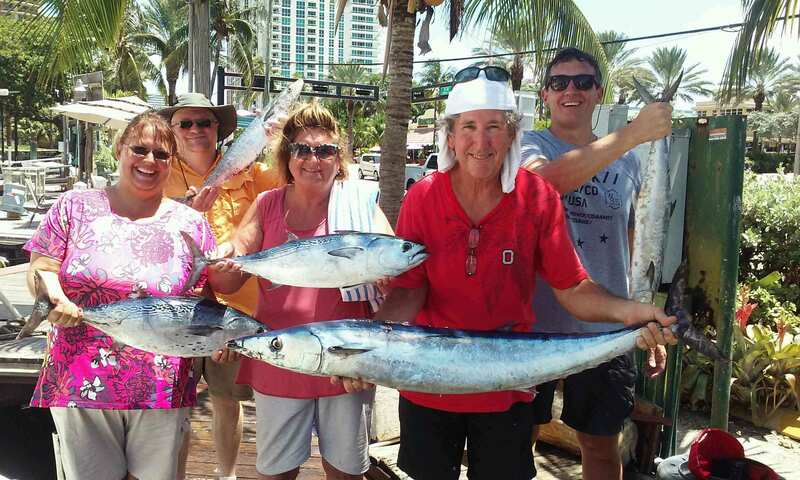 Kingfish and tunas are biting really good and there are still some bonitos around as well. Summer is always the best season of the year for action in Ft Lauderdale. The bonito run , although starting to slow down a bit, has rejuvenated the abundance of fish on the reef. Every year, bonitos make a huge migration down our coastline in unimaginable numbers. Hundreds of thousands of bonitos flow into our reefs over the months of June through August. They bring with them tons of other species that travel with and feed on those bonitos. It really lights up our fishing and brings a lot of new fish into our waters. Trolling is the best technique this time of year for catching the most fish. 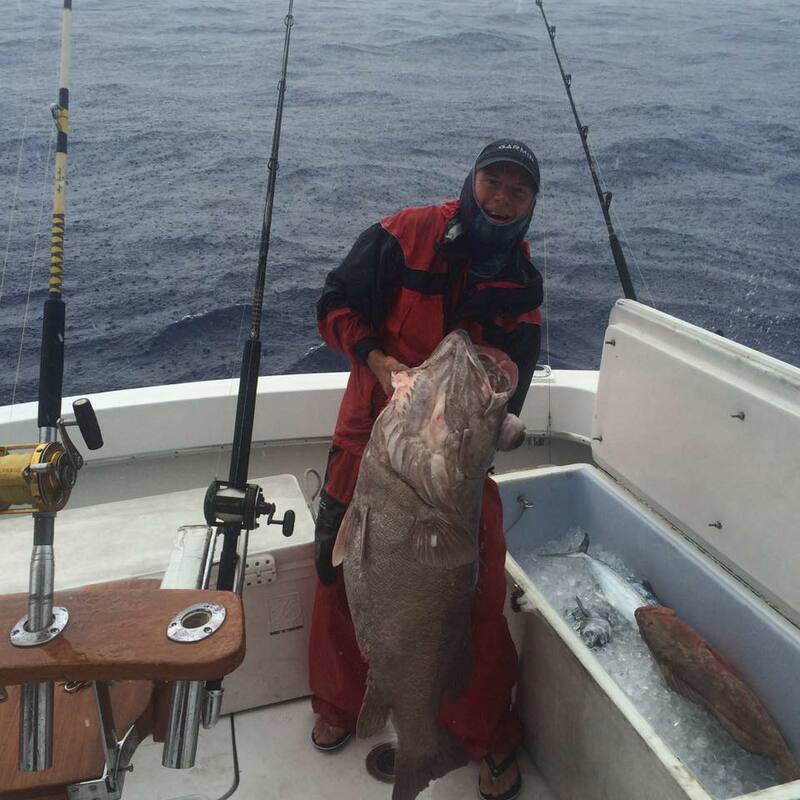 Our sportfishing charters are concentrating on trolling the reef. 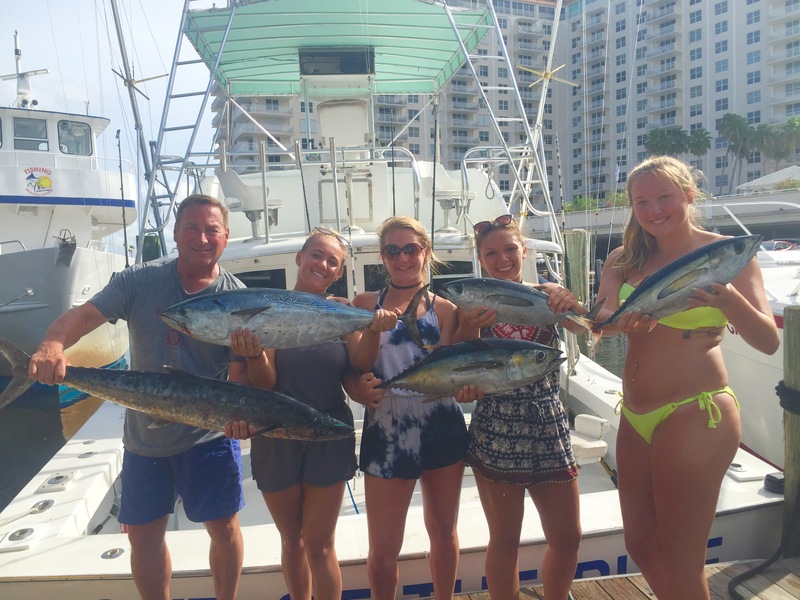 Main catches this month are kingfish, bonitos and blackfin tunas. Blackfin tunas are biting particularly well. We’re catching them on dusters and natural feather baits. Blackfin tunas school up into large groups of fish. They are pretty easy to find. We spot them breaking the water when they are balling up schools of smaller baitfish. Most of them are football sized tunas, in the 5-10 pound range and sometimes a monster 30+ pounder. They all travel with the bonitos. Bonitos are actually tunas too. In fact, their true name is little tuny. Blackfin tunas are great eating (sushi, fish tacos, etc…), but bonitos are not. Bonitos are too muscular with too much blood to make them a good eating fish so they are a gamefish. They are one of the strongest fighting fish in the ocean pound for pound. Since we are spending a good amount of our sportfishing charters trolling, we’re also finding a few really big wahoo and barracudas. Wahoo bite best on the tide change especially right as the high tide reaches its peak and begins to recede. This is the witching hour for wahoo. The tide change is usually strongest on the full and new moons, making those days the best bet for wahoo. Barracuda and sailfish are two kinds of big game fish that are also possibilities to catch on our sportfishing charters. 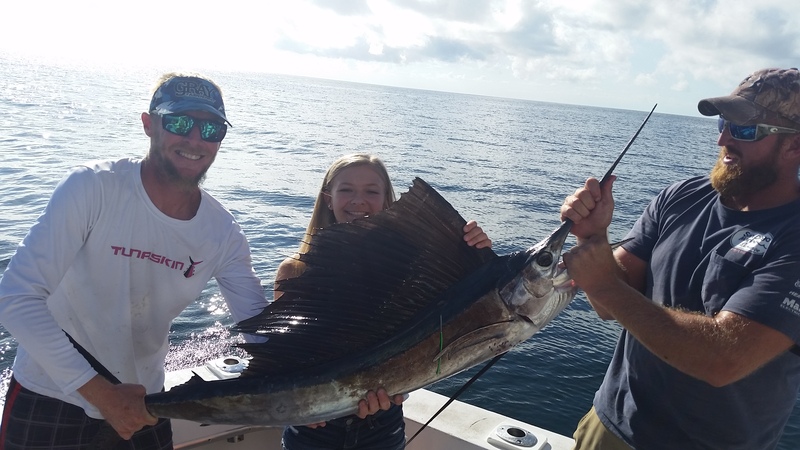 Although not the best time of year to catch sailfish (winter is the best season), there are some around this time of year… we’ve caught several this week. Nice sailfish caught by this fisher gal on our sportfishing charter. For our drift fishing trips, snappers are biting very good. There are some big mangroves and a few mutton snappers biting on the day trips. 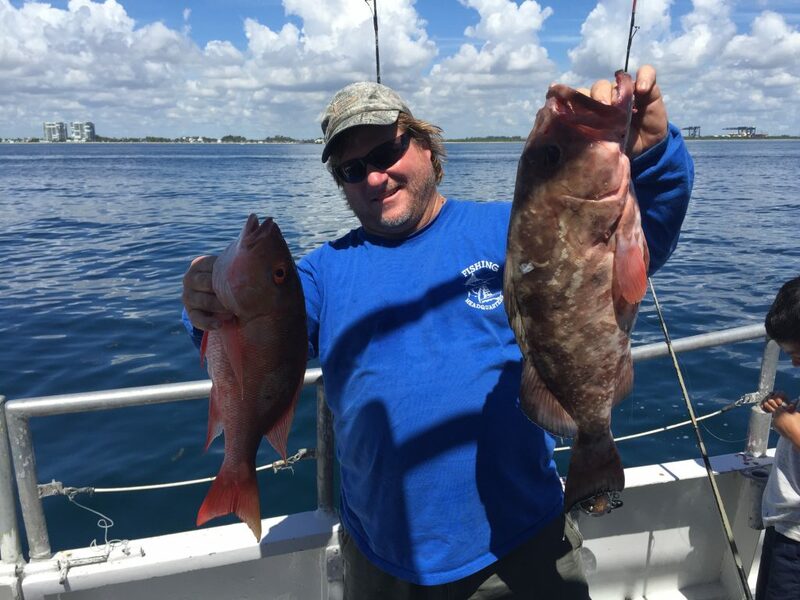 A few keeper sized red groupers were caught over the past couple days. Lots of porgies are biting too and the usual catches of grunts, triggers and small jacks. Night trips are catching good numbers of yellowtail snappers and keeper mangroves. 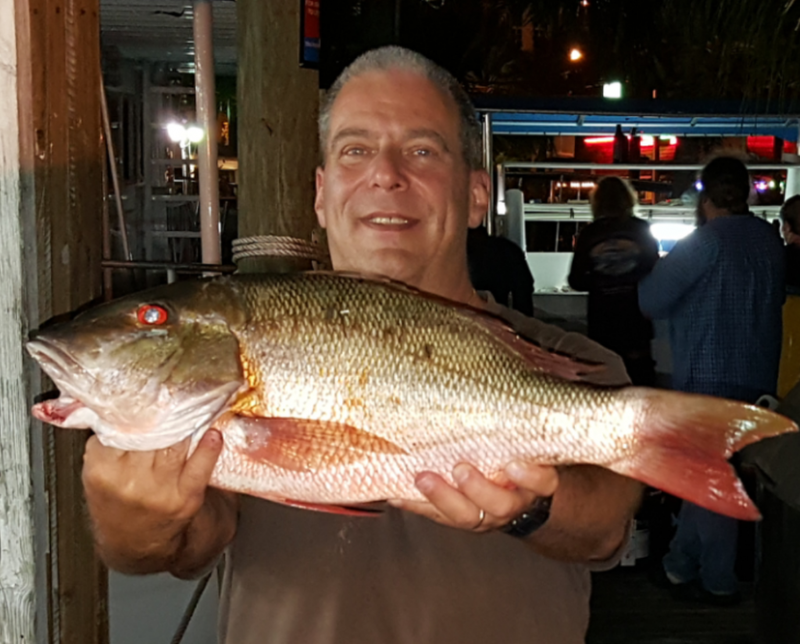 We sometimes get a mutton snapper or two on our night anchor trips as well. Basically, we’re getting into the bigger snappers during the day trips and higher numbers of snappers (although smaller) on the night trips. Day trips are also getting a random kingfish or blackfin tuna while drift fishing as well. All in all, mostly good days this month fishing our drift boat trips.